Grown ups will reply that the Hadley Met Centre uses thermometers near airport tarmacs and air conditioners (when they are lucky enough to even have thermometers). It’s a shonky, degraded dataset with barely any data before 1950, and it starts with freezing tropical islands and boats roaming around on land and then adjusts up the kazoo to make it even worse. The NASA set uses the same bad equipment, holey data, and adjusts by the kazoo squared. The past is constantly changing, the trends are fitted post hoc to the models and the results don’t fit historical records, or satellite data and the weather balloons. They will protest and say their trends fit the RSS satellite data. They won’t tell you that UAH satellite dataset is better because it agrees with the weather balloons, tosses out inconsistent satellite measurements, uses three channels not one, and uses satellites free of diurnal drift to estimate errors in others. The RSS set is internally inconsistent, starts with model estimates, not observations, leaves in an error that creates artificial warming, then corrects it just in time to stop the exact same error from creating cooling. What do you call a dataset with part-time non-random errors? Junk. The Christy Graph has all the data we need. It’s as close as we’ll ever get to proof the models are guesswork that failed. Thanks to Tom Quirk, John Christy and The Climate Study Group. Unfortunately the bureaucrats will stop this message getting out to the wider public and to any policy makers who could actually stop the climate change scam. Am I surprised or should I be shocked? Not surprised, but nonetheless appalled that when incentives are offered, rorting always seems to occur. It’s an add in Australia’s largest circulation (national) paper. Granted that most of our politicians cannot add 2 and 3 and come up with a correct answer, but they would find it hard to ignore the advertisement, even if at least half of them will try. If you mean The Oz, it’s interesting to note that the ads don’t appear in the online version. Unfortunately, only a large, sustained and undeniable cooling will stop the gravy train now. Unfortunately, the alarmists would claim that any cold period was down to their efforts at mitigation – and claim that we must double-down on banning petrol/diesel cars etc and building more windmills and solar farms. But only in the West/First World, of course. I suspect that regular, mass, blackouts will have much the same effect, probably a greater effect as it directly hits the public where it hurts. Maybe ‘smart meters’ were part of the long term plan to ration electricity to the masses when it was in short supply. A bit like petrol rationing back in the day when you could only fill up on odd and even days, depending on your number plate, and sometimes only be able to buy a certain amount of petrol. This is called progress. A re-elected Andrews government has pledged to install mobile charging ports at eight CBD and inner city train stations if it wins the election on November 24. I agree totally. Only mass blackouts and continual electricity crises will wake the public from their torpor. No ..this is called “control of the population”….by way of technology.. The two main technology controllers at present….energy and individual’s money.! On Cue the BOM has put out its pre-Summer prediction favouring “warmer than average summer conditions for almost the entire country, particularly for overnight conditions.”/ Once again it will likely be wishful thinking on their part. It has also said that “so far this month, Sydney’s average daytime temperatures have been tracking more than 2 degrees above the November average.” Have they not been outside this month? Spring, including November has been much cooler than usual so I can only imagine they are basing this on microbursts of heat and are still not conforming to international best practice. Either that or there is some serious homogenising going on and they are using temperatures from the west and far north to do it. If climate gate couldn’t stop it, I’m not sure even an ice age will stop it now. Congratulations to Joseph Stiglitz on his well-reasoned article, and to the children in the US who are prepared to fight for their environmental future (“Forsaken children sue Trump to save their planet”, November 15). I, like many others, despair at the thought of what sort of environment our children and grandchildren will live in, as a direct result of continued government inaction to address the pressing issue of climate change. Government ministers argue that we are such a small country, and therefore our actions will make little difference, but on a per capita basis Australia is among the highest emitters in the world. If all of the 90 or so nations that contribute less than 1 percent of emissions were to act, that would account for around a third of the global total. We must put climate change action front and centre at the forthcoming election and make our politicians accountable too. Allen, they are insane over there – I regularly comment on the blog pages and it astounds me how many of the Fairfax readers are so committed to alarmism that they refuse to even contemplate reading anything that might cause them to question their religion. The models are beyond a joke; they are lies. ‘We see a cooling trend’ says NASA scientist. No way! They have yet to run out of someone else’s money and their ideological, unfalsifiable raison d’être is installed in perpetuity. So, with a cooling trend and warmest scientivists grudgingly admitting the same, yet suggesting in the same exhalation that it won’t be as bad because of AGW mitigation, in equal portion one grudgingly admires the eco-Marxist identity politics obsessed Left for its seemingly infinite, inexhaustible and brazen ability to lie, confabulate, manufacture, twist, torture, protest, denigrate, isolate, demonise, chastise, spin, justify, model, invent, chant and believe in anything deemed to be part of the globalist Rainbow Cult. Whichever or whatever way one looks at it, there is no hope. They remain an evolutionary, social and economic dead end. In this instance, dying is a painful but inevitable business. More than just lies, they represent outright malfeasance. At one time I was willing to give alarmist scientists the benefits of doubt that their many errors were due to incompetence. That ship has sailed as I’ve become more and more convinced that the many errors are a manifestation of abject evil arising from the third worlds envy of western success combined with the globalists guilt of being successful. I don’t believe it’s guilt. It’s more of a blind ideological view of the world, plus a self aggrandising puffed up self importance that refuses all advice and evidence to the contrary of their own beliefs. Take Angela Merkel as the example. She is destroying Europe to a point where recovery will not be possible, not because of guilt, not “just” for ego. But because her beliefs in humanity, are not the same beliefs held by those she believes so strongly in. She believes in open boarders and helping those who are downtrodden. But those who come into Europe under her umbrella do not hold that same spirit. They are not the friends she thinks they are. This is not guilt, this is not mercy, this is not ego; it is blind faith, believing in a fairy land, where all evidence is to the contrary, but she refuses to see. Remember, she was a Stasi informant, back when East Germany was a Russian satellite state. She hasn’t really changed at all. Even if we only start at 1914, Germany and Europe have had someone pushing to be on top. Angela has now made it. But we can’t crow too much. Britain gave themselves the Boer war etc. And what did Joe Average get out of all this, SFA and appendages like IKFA. At least WW3 has been bullet free, it’s just that we have been Enslaved an Robbed in secret. Blind faith is definitely a contributing factor to climate alarmism and many suffer from misplaced faith that all scientists are objective and know what they’re doing. The top driver for all politicians is ego, especially those at the top. Faith allows you to see past logical flaws and clearly applies in order to accept subjective positions that are objectively flawed. It seems to me that the far left globalism is driven by the idealism of the utopian Star Trek Federation. They don’t understand that this utopia is only possible when you have free and infinitely available energy and raw materials. They (klimate scientists) can’t accept there may be a built-in delay. Everything has to happen immediately to be credible. So if it’s not cooling RBN (Right ****** Now), then it’s never going to cool; Warming will continue next year, or next, next year, or by 2100, or, or … Then when it does cool, oh dear what a big surprise that’s going to be. David Evans’ work strongly suggests a delay … so we have to be patient. Climate computer models are “reverse engineered” in a complex, chaotic system. They are not constructed on a solid base. There are huge gaps in input data, and until those gaps have been filled and their data applied for a period of time there is no chance that model outputs can be reliably repeated. Reverse engineering can be a valid practice, but in this case it has a long way to go, if ever. In the thermosphere , yes . But they are much more than that ! trying to save the planet. can save the planet ! believe it, like a flock of trained parrots ! Adding CO2 to the air is beneficial. truth is not a leftist value ! … that doesn’t yet exist. nothing can be falsified ! TCS of about +1.0 degrees C..
so can’t be trusted ! When the Maldives are flooded, something predicted for years, THEN I’ll believe that climate warming is real AND dangerous! Since the billions invested in new resorts, hotels, golf courses and airstrips the Maldives have decided to cancel any further aqualung cabinet meetings. Sea level rise used to be good business for the Maldives. Now, not so good. Notice how The Sydney Morning Herald, an infamous Catastrophic Global Warm-monger, runs full-page advertisements in its Saturday edition for luxury holidays in hotels on the beaches of the Maldives. The hypocrisy of this holier-than-thou addiction to CGW, as long as it hurts the Australian economy but does not hurt the bottom-line of The Sydney Morning Herald. on the Maldives is unbelievable. that will soon be underwater (not). What still gets me is the large amount of warming caused by adjusting the raw thermometer data. yet we still have the adjusted increase in warming. Cuts to the reason why I maintain none of these watermelons can count to ten and someone corrected me ten was too high , the numbers we are dealing with are minuscule and irrelevant. The obfuscation from the warmists is clear as day as long as you can count to ten or less , anyone who argues otherwise is brainwashed to the CAGW religion and never got the hang of their one times tables . The problem for higher temperatures is that the current reality for Earth’s atmosphere temperature is that CO2 levels do not have any effect but more importantly there is a gigantic Heat Sink waiting to soak up any slight perturbation in the equilibrium. An essentially infinite heat disposal unit with a temperature of minus 272°C i.e. About 1.2 C° above absolute zero. It seems to be an accepted concept that when solar activity is higher, then the atmosphere expands enough that low earth orbit satellites experience a small, but measurable increase in drag. Consider the “combined gas law”, summarised as PV/T = a constant. thus P1.V1/T1 = P2.V2/T2. Just wondering how long it will be before BOM (Bureau of Manipulation) claim that they can no longer do accurate forecasting because of climate change ? What are you talking about? they haven’t been able to do it for 40 years. In the early 1980s I was operating an evening flight from Adelaide to Perth – about 200 miles out we requested the current weather and was told it was CAVOK -fine for the next six hours. Some minutes later we started to flashes in the distant sky and on the 180 nm radar scale we were alarmed to see a line of thunderstorms to the west of Perth. We just managed to beat them into Perth before the aerodrome was closed with severe thunderstorms. They can’t even forecast in real time let ahead. That’s right. However, they’re excellent at predicting what the temperature should have been in the past, irrespective of what their records, taken at the time, show it to be. I think they’ve been imbibing too much of the Rutherglen (Victoria) product on tax-payers’ money. I should have used the “sarc” tag . untouched by human hands”, are much better than they used to be. Had they been available forty years ago a lot less hay would have been weather damaged. Don’t know how I did that. Clearly didn’t check before posting. Need new glasses. Absolutely RK, Back in my youth I worked for a local radio station, we used to regularly get “Fine and Sunny” on the 5AM forecast while one look out the windows showed it was **issin* down raining. Some days it was so bad we had to change the forecast to “rain clearing to…” just because looking out the window was so incongruent with the BOM. To this day its no better, the BOM are forecasting a hot dry summer in SEQ. I’ll wager it’ll be wet and overcast with high humidity this year. On long range forecasting assuming the opposite to the BOM is a better bet than what they are peddling. Given that they are bound to be right every now and again, for example the last few years in QLD have been really quiet on cyclone landfalls much below the BOM forecasts, if they keep forecasting higher than average cyclones they are bound to be eventually right, even a broken clock is correct twice a day. The fact that the BOMs forecasts are right much less than the level of pure chance means there is a bias in their forecasts. A bias that is wrong. Authors admit study giving rise to Ocean Warming being 60% worse than we thought claims was junk. As we all know it was another attempt to promote this mendacity.Food for the MSM and regurgitated but never acknowledged as false. MSM: idiots feeding the ignorant masses. If you don’t read the newspapers, you’re uninformed. If you do read the newspapers, you’re misinformed. This bunk may score well in the alternative science bubble, but really, the climate group ?, a bunch of farmers with no relevant science degree between them ? I’m guessing that they haven’t dared to present their’empirical data to any sore of peer review ? The graph still shows an upward trend. You have to try harder than this and stop insulting the scientific method. Try looking at the graph. Some data from scientists and other (satellite) from 2 PhDs. In any case what makes you imagine that farmers are worse than scientists at reading a thermometer? At least they would read the temperature rather than sitting inside in the airconditioning and decided what the reading should be. Great data, again, why the shyness in submitting it to scientific scrutiny ? btw, someone asking why you make no progress is not a troll, more of a Socrates really. Perhaps if the “scientists” and their followers actually went outdoors once in a while they’d notice that the predicted temps are actually falling a bit short most of the time; the oceans are not boiling, nor acidic; insects are still buzzing about in the skies, woodlands, deserts, etc., and so on. I find I can trust a farmer far more when it comes to climate claims and weather predictions. They rely on this knowledge to ensure a good crop, a job, an income. “I can trust a farmer far more when it comes to climate claims and weather predictions. They rely on this knowledge to ensure a good crop, a job, an income”……. If the birds nest on the slopes or higher ground……a wet season is predicted.. Your reply makes clear of your ignorance on how unreliable “peer review” really is. Maybe you can take those rose colored glasses off and look around without the boring “is it published first” bromide. It is old and boring. Since you have yet to make an argument about the post itself, it could be that you have nothing to say, which is why you act like a troll instead. Peer review is all we have, it’s part of the scientific method, it sometimes fails but eventually corrects itself. What would you replace it with ?,farmer review ?, Alan Jones review?. And who would review them ?. It’s because peer review has laughed at all the deniers’ efforts to date ( that is those who have bothered to submit anything ) that you guys attack it so much. Re, the post itself, please read my initial post. No it isn’t all we have, there are other ways to produce science research than to post it in a journal, surely you have heard of books, Conferences, Postal mails and so on. Scientific Method has NOTHING to do with peer review since it all about Reproducible Research, there have been many discoveries that NEVER used Peer review at all. The space age are full of examples where peer review wasn’t used at all in making so many things to support the Apollo Missions. Please don’t be so ignorant on how science research develops. Sure, try that on planet Earth please, any whacko can publish a book or speak at a Heartland conference or EVEN post their ‘evidence’ here, it means nothing. NASA’s achievements are science based, ie, the result of peer reviewed reproducible research, they didn’t heed a bunch of farmers. All ‘discoveries’ were reviewed in order to become accepted, do you think the opinion of one person is enough ?. Again, what would you replace the scientific method with?. Good luck in playing Galileo. Again shows he is CLUELESS about science and the scientific method. NASAs achievements in reaching the moon were science based. They have achieved precious little since then, because they have strayed away from real science into JUNK science. And farmers are WAY more intelligent than mindless SHEEP like you, IKFL. We are STILL waiting for your empirical evidence that atmospheric CO2 causes warming, IKFL. You know F’all about science. Barista degree ???? Peer-review for journal publishing is NOT part of the scientific method. What “climate science™” should start to do is to adhere to the scientific method, instead of continually running away from it..
… but it would then collapse in whimpering heap of slimy ooze. Ian, I gave you example of the space age, where “peer review” was largely bypassed for reasons that still eludes you. You ignored that example to post fallacious statements that doesn’t support you at all. The Space Blanket never went through peer review at all since it was ENGINEERED at the NASA’s Marshall Space Flight Center. No mention of “peer review” at all. You are one confused boy. I doubt Ian-knows-f’all has any idea about the scientific method. And he just PROVES it. Peer review for journal publication is NOT part of the scientific method. You have just outed yourself as a NON-SCIENTIST, with ZERO knowledge of what the scientific method actually is. For the audience Peer review is part of the publishing process not the Scientific Method. Its role is to be able to catch any serious errors, grammatical, math, science and spelling errors in technical prose prior to publication so the Journal doesn’t look silly. It didn’t exist until recently. Not so long ago publishers kept a board of experts on staff that would look at submissions and approve those that met the mark. Now, the publishers can’t afford to pay an expert panel so instead they send the article out to a group of peers to check the spelling grammar and arithmetic. The big problem with peer review is that the peers can also comment on the content so they can act as gatekeepers keeping “Dangerous Ideas” (Dangerous to their funding) out of publication. In my view peers should not be able to comment on worthiness, if they can’t show anything wrong with the math/science then is should be published. Many journals are now skittish about displeasing their slave proofreading labour and routinely refuse authors with new and dangerous ideas. To my mind an expert panel of luminaries like Maxwell or Feymann committed to science and the scientific method is probably superior to the current process of sending to an anonymous group of peers of questionable worth and unknown motives. Do you even know what “empirical” means ?????? If peer review is so great how the Lancet ( I think it was) came out a while ago saying something like 50% of publish medical research papers were wrong or inaccurate? Maybe. The writing has a familiar ring to it. It sounds like MalSpeak, or the sort of patter that the real Mal would employ in muddying the waters around “The Bank”™. for a speech to the staff at Golden Sacks. Perhaps we have a paid “influencer” trying to discredit Jo’s efforts at bringing reality to the fore? Ah, great, another conspiracy theorist here, who would have guessed ?. Jo discredits herself without any help, this is why she’s ignored by scientists. Zero evidence of anything except mindless sheep-like belief. You are TOTALLY INCAPABLE of producing one single piece of evidence to counter anything Jo has said. IKFL, you are NOTHING but an EMPTY VASSAL. Even the little red thumbs have ZERO-EVIDENCE..
Or are totally incapable of producing any. They must be DUMB, or illiterate, or just plain ignorant. Come on LRT.. you can do it. !! Ian the error margin is enormous and will only get worse in the years ahead. AGW theory has been falsified and with a cool sun there is little prospect of the situation improving anytime soon. Except of course for a strong El Nino next year, which may give the warmists some encouragement, but as you know ENSO is natural and uncontrollable. The good news is that our grandchildren are safe, spread the word. Depends how long and deep the cooling trend is. We should just tell them that its only a return to the 1950s and 1960s, a slight dip which humanity will survive. The End Of The Age Of Abundance. Oh dear Ian. It’s all about the difference in the model and satellite trends. Aaargh – formatting all wrong! Serves me right for typing on a phone. Anyway, I hope the link amongst all that text makes sense. Well, more sense than the junk models Ian probably clings to. Empirical data submitted to peer review? Empirical data is what it is. It by definition is not subject to correction. I guarantee that there ae MANY more science and engineering degrees on this web site than Ian-knows-F-all has ever met. Can anyone dredge up that link where people stated their qualifications? It would leave any alarmist blog grovelling in the mud of their own BS. We are waiting.. scientific method and all that. …. or you could just run around like a headless chook like every other warmist.. !! He reminds me of the Japanese WW2 prisoner of war camp commander who addressed the prisoners angrily, “you men think I know f*ck nothing”. “Well you are wrong, I know f*ck all”. I’m sure you’re channelling David Niven’s anecdote from the filming of The Charge of the Light Brigade. Oh well, who needs facts anyway ?. All you have is zero-science bluster. Produce empirical data that shows that atmospheric CO2 causes warming. Run and squirm, duck and weave….. the AGW apologist’s way. Why don’t you produce empirical data that shows that atmospheric CO2 doesn’t cause warming. Not even the most brain-addled AGW apologist can pretend that humans cause El Ninos… ! Peer review has FAILED on this. Sorry Ian, you simply have nothing to offer here. OK, that’s maybe a couple of scientists for you. Now , let me see, how many against her ?, Oh , only the rest of the scientific community. I know that’s a formal logical fallacy but the real world has to function on the evidence, so there you have it. But in your alt logic world that’s counted as a WIN. AS IV’E SAID BEFORE, peer review does correct itself, otherwise you wouldn’t be bleating about its failures. Time to hand your degree back and join a men’s shed. … if you’ve got one or more. But then I’m not going to hold my breath. Let’s see, 7 posts full of nothing but unsupported assertions, and ad-homs, no links to supporting evidence at all … no discussion, no debate, just rude negation … all typical troll behaviour. Absolutely nothing original … how boring. Ian knows = ian knows SFA. This comment was not submitted for peer pal review. Seems IKSFA has a degree in bed-wetting and sulking. Certainly no evidence of anything of any rational or scientific worth. STILL totally evidence-free in every post you have made, IKSFA. We are all still waiting for you to produce the most rudimentary proof of the AGW scam. Produce empirical evidence for warming by atmospheric CO2. WAITING !!!!! Nothing to counter one single thing in JoNova’s post either. Just an EMPTY MESS !! The comments of IKFA have a resonance with comments by a similarly named person from a few months ago. All the essential elements of the modern CAGW drama have been demonstrated, especially Victimhood. You get the message that this blog should not be allowed to discuss “The Science”™ because our discussion contradicts the UNIPCCC. This, despite the fact that unipcccc direction is guided by Nominal Scientists whose scientific skills pale into insignificance compared to the collected wisdom and skill held by contributors to this blog. Whether IKFA and other sub-aware “influencers” really care about fellow human beings, deep down, is not clear. Their adherence to Unipcccc formula for saving the planet and helping MalEx cream off more millions is really appreciated by those beneficiaries. No doubt The Hidden Beneficiaries stop now and then to drink a glass of Champagne and toast the many gullibles like IKFA for their contribution. Not a shot fired but millions enslaved by a supreme body, The United Nations. Amazing, and as TdeF has intimated, most probably the major elements of the scam have been initiated without true legal authorization from our constitution. KK – IKFA is a very successful blog timewaster. He says something just stupid / clever enough to get a response, then keeps it going as long as possible with as many respondents as he can to waste our time and clog up the blog. The only way to deal with this species is not to respond. I’m not going to waste any more of my time on this subject, and neither should you. Poor IKFA, STILL running away from producing any evidence. COWARDICE is the very best word for it. Even a low end barista puts up a more scientific argument. So funny to watch someone so PATHETIC and knowing absolutely NOTHING except propaganda pap. You are an EVIDENCE-FREE, empty sad-sack, IKSFA. Thus far the superstition/supposition/assertion for CO2 warming the atmosphere has no verified empirical evidence. It is just a baseless assertion, nothing more. If one scientist can, with verified measurements, show that this CO2 supposition is in error, then it is enough. The show is over, it’s finished. The UN-IPCC is rendered null and void! That’s all it takes just one scientists, — not a crowd, not any number of believers, not a congress, team, or consensus, no papal conclave — just one scientist would be enough. And for many Nic Lewis is that person already. Which, I might add I (among many, many others) have already shown. The Hypothesis IS dead in the water at the moment because the assumption that EMR IN = EMR out is wrong and it can be shown that IPCC amplified warming demonstrates a violation of conservation of energy at the earth’s surface. We should expect much more trolling because there are multiple elections on the way. The Left has released their paid trolls like Maxine to try to neutralise us – Last time I saw Maxine was at the last federal election. I’m pretty convinced she is a political plant. Oh this is so easy since it was NICK LEWIS in a BLOG post who corrected them, and they ACKNOWLEDGED IT! You are fast being exposed as a colossal ignoramus who doesn’t even keep track of the issue at hand. Ian, the “peer review” credibility got shredded when “‘Climategate” first saw the light of day. It seems to have been replaced by “mates review” in a lot of cases and is not to be relied upon. Publishing in a science publication was recently shot to pieces by the graduates who put forward rubbish papers some transcribed from Mien Kampala that got through the review process and appeared in print. No Ian, forget Peer review and publication, look instead for replicability! Oh Dear, read Mien Kampf! forget Peer review and publication, look instead for replicability! All data and all methods fully published. Nothing omitted. … and the published material is also freely (no pay walls allowed!) available to anyone/everyone who wants it. That graph is to 2016. There has been cooling since then. Is there any evidence of a flat-line temp in the history of the Earth? Has there ever been a time when decades, let alone centuries, passed without a cooling or warming trend, broken by slight reversals and oscillations? Is constant temp even possible over any but the shortest periods? Is it even possible over a decade? So how does it matter if there has been an uneven warming trend since 1700? How does it matter if the period post 1970s has shown an upward blip within that longer warming trend? What of any substance is being disputed here? Nothing of substance is in dispute here…but there is still this dispute. It does not matter if “global warming” is an ascertainable fact. Once ascertained, it would be a supremely trivial fact. Considering that it is measured in fractions of a degree, it is a pretty flat trend in the overall scheme of things. Moreover, the satellite records necessarily begins during the 1970s, a cool period, so it is hardly an upward trend over the long term. Thus it seems that those usually associated with the Right of the political spectrum are doing very well from the current dispensation. Thus it seems that, unsurprisingly, political currents from the Right are also very much in play at present – and they are earning a lot of money! 1. Dieter Helm, “The Carbon Crunch”, Yale, revised & updated, 2015, especially at pages xii and 103. All about the money, Not The Science. Thank you Idiot_Wind. You make a necessary point. I accept that my comment was incomplete and agree that globalist power grabbing dictatorial greed spans the political divide, transcends it, as indeed it does the populist nationalist movement. The trans-global corporates align with globalist ideology and paradoxically embrace the ideology of the Rainbow Cult, wider virtue signalling, “social responsibility” and climatism, even though they are functioning capitalists. As you say, and as Dieter Helm and KK say, follow the money. For all that, the Left remain altogether and manifestly more visible in academe, media, bureaucracy and government (notably in Oceania and the eco-Marxist UN). The Left is also a natural bedfellow of the collectivism, the regressive tribalism, which lies at the heart of identity politics and the Greens embody the expression of eco-Marxist doctrine. Capitalism has long been willing to profit off the stupidity of others hence Caveat Emptor (Let the Buyer Beware). The fact that capitalism can profit off the stupidity of the unicorn fart and moonbeam cult does not in anyway suggest the the moonbeam cult is right or just. For example the feed in tariffs are a hard to ignore stupidity for those that can afford to exploit them. Even so the FIT paid represents the return of only a fraction of my taxes so I don’t feel at all guilty taking back some of my tax payments, especially given my agreement with the Late Great Kerry Packer who famously suggested to the senate he would not give the government a cent more than he needed to as they didn’t spend it with any probity. So 30 years into an unproven hypothesis, the sole indicator of global warming, temperature growth is wrong by a factor of 3. That is the fact, not debatable. The rapid sea rises, not noticeable. As for the consequences predicted by the same models, they are all wrong. Things go up and things go down naturally in cycles, but man made CO2 driven global warming is nonsense. So at what point will we Australians stop paying billions to prevent something which is not true from happening? This is quite apart from the question of how we alone were going to do it anyway? With 350,000 giant windmills on the planet, where on the planet is CO2 going down or even taking any notice of the trillions spent to reduce CO2? The greatest moral question of our generation, is really why have our politicians lied to us? They are still lying. Then having paid for all these useless windmills and solar panels, why are we still paying to give windmills and solar panels away to greedy people? Why are we paying people $1million dollars cash a windmill every year on top of what they get for the electricity in the world’s most expensive electricity grid? You do not have to borrow all the money for a solar panel to heat your swimming pool, we the people give you the middle class consumer one half in cash and then pay you for what electricity you cannot use and do not want and we do not want either. Why? What do we get? How is all this money flowing in the billions overseas for absolutely no effect on global CO2 better for Australia and Australians? How does this even begin to make sense? Why is nothing we have been told true? Why are California’s bushfires due to ‘Extreme Climate Change’? Where? Really, in the end, your windmill or solar panel not only costs you nothing, it sends you other people’s money for something paid in full by the same people? Mugs. Takes from the poor, gives to the rich. Government legislated robbery. All in a good cause, enriching others. That’s what modern Neo-Classical economics is all about. And if you aren’t confused by it, then you aren’t paying proper attention. Good sensible stuff. He does say climatologists predict hotter, drier summers but his main point is forest management which used to be done by American Indians. He also says fires were less frequent and smaller, which is debatable. However his general points on forest management are great and necessary. Plus the unaddressed point of people building in the new forests created by limiting fires and so creating both megafires and mega damage. His funny point is that by banning fires and even controlled burning and burnoff smoke under EPA rules, we create megafires and far worse out of control smoke pollution. In legislating against fires and smoke and building in the resultant dense forests, we make matters far worse. He would be amazed that in Australia we are not even allowed pick up fuel load on the forest floor or graze cattle in the high country. The knee jerk Climate Change response is unthinking, wrong and useless. Banning CO2 is just absurd. You may as well ban H2O. The Green political group actually banned Chlorine, an element of the periodic table. Now they want to ban the one molecule essential to propagation of all life on earth. All trees are made almost entirely from two molecules, H2O and CO2. Trees come from the air, not from the good earth. Without CO2, they would not exist. Also a recent 50% increase in CO2 means a 50% increase in vegetation. The only difference is the grass/trees balance, grass fires versus forest fires. What the American Indians and Australian ab*rigines knew is that we can’t eat trees and unlike Asia, neither continent is covered in fruit trees. We love forests, useless pretty forests but we have to recognize that forests of sap filled pine and gum trees were meant to burn and reproduce by fire, unlike European elms, oaks, plane trees. In Victoria, our government now spends $100Million a year of our money pruning and disfiguring inner city non flammable trees while councils plant gum trees. A great business. To prevent city based fires in Elm and Plane trees. All advice by Green opportunists and tree racists who hate any English trees. England is not famous for major forest fires but since independence, we want gum trees to show we know better. Ignorance compounding arrogance. A few unusual observations backed by good photographs include the idea that modern dense forests are a recent creation from our practice of putting out wildfires. Australian ab*rigines and American Indians practiced burning for a very long time. As he explains, in putting out fires, we have created denser forests with much greater fuel load. In Australia one consequence of that is that the fires are so intense, the trees are killed. This has far greater environmental consequences than many small, less hot fires. The forests do not recover and the topsoil is lost. However he does not mention that where lightning strikes starts many fires, the major source of fires now are arsonists plus aerial power lines. However you can do nothing about these problems when the Fire Chief blames Extreme Climate Change, presumably to deflect blame as that is meaningless. Politically who dares blame the Greenies for the devastation they cause in their unreal world of fairies, gnomes and elves in the forests and tree worship? California is so much like Australia. Now also in vegetation. Controlled burns are essential to save life and property. Flee a raging fire. Build a safe area around your house if you want to save it. If you cannot flee, get underground. Do not take advice from Greens. They are nuts. Nowhere in this quick survey[1:] of the warmest ocean areas does the sea water temperature reach 30C or more. Why? I suggest a start with the evaporative cooling curve for water, but that can only be part of the story. So the answer to why is that any large patch of sea water that exceeds the trigger temperature gets cooled by a thunderstorm causing major evaporation and falling sea water temperatures. This hardly seems challenging science, although there seems to be a large body of influential climate scientists, bureaucrats and politicians that cannot grasp the point. Sea surface temperatures must be 82 degrees Fahrenheit (F)[27.8C] or warmer for tropical cyclone formation and sustenance. A simple piece of once well known but now ignored science is that the maximum temperature achievable by our oceans is derived from the weight of atmospheric mass pressing down on the water surface so as to fix the amount of energy required to enable the phase change from liquid to vapour. The proof is that the energy required by the phase change is less at the top of Everest than at sea level. At 1 bar atmospheric pressure the maximum achievable temperature of the ocean surface before convection kicks in and cools it is just under 30C. The greenhouse effect is a result of atmospheric mass conducting and convecting aided by the fact that water vapour is lighter than air. It is nothing to do with GHGs at all. That was once common knowledge until climate science was taken over by astrophysicists with no knowledge of meteorology. To them, all that they know about is radiative energy transfer so they prove the maxim that to a hammer, every problem is a nail. They are clueless about real world non radiative atmospheric physics. Hit the nail on the head Stephen. To them, all that they know about is radiative energy transfer so they prove the maxim that to a hammer, every problem is a nail. No respectable physicist could abide this non-science. I assume that you were adding to Stephens comment. He was basically saying that they don’t engage with conduction and convection and they look only at radiative transfer. And your comment suggests that they don’t even do that correctly. I would possibly disagree with Stephen that radiative transfer is not important but I haven’t looked at the relative quantities of basic air mass and water vapour. The main thing for me is that CO2 is an irrelevance in terms of heating or trapping heat in the atmosphere. In the upper reaches of the atmosphere CO2 may be, in fact, a coolant, in that it helps low grade energy finally escape to space. Sort of – The key disagreement I have with Stephen is that climate scientist “know” anything at all about radiative energy transfer. Their concepts of energy quanta and E-M energy transfer are primitive at best. The stabilising presence of water on Earth’s surface is far more complex that Stephen states. The whole system relies on the connectedness of large water bodies around the globe. If oceans were not connected as they are across a wide range of latitudes, Earth would be barren and dry within 33 degrees latitude north and south; lakes or seas in the mid latitudes and much more ice at the higher latitudes. The connectedness of the oceans distributes the heat. Without that, the solar flux in the tropical latitudes would simply evaporate all the water and air currents would transport it to higher latitudes where it would precipitate as water or ice depending on where it came down. The Dead Sea gives some indication of the need for ocean connectedness. It is hyper saline and its surface is 430m below global MSL. During the Pliocene the Dead Sea became disconnected from the Mediterranean thereby losing its connectedness with the oceans. At its latitude, current depth and current salinity it seams to have reached equilibrium. However the equilibrium would be different if there were no other interconnected water bodies across tropical latitudes. Stephen may still be having problems with his adiabatic process, which no doubt he will come back to explain. This whole idea is really interesting and top marks to Will for drawing it to our attention. The oceans play a significant role in atmospheric temperature change, true or false? No problem with ‘my’ adiabatic process as far as I know. What did you have in mind ? I was thinking of the flack you received at Watts, but you explain your hypothesis clearly in this post. If we accept the proposition that CO2 plays no part in temperature, then it must be all down to the sun, earthly gravity and atmospheric mass. This is going to be hard to sell. I like the argument that GHG theory can’t explain the temperature on other planets in our solar system. If this could be explained simply, then your theory might get more traction. Radiative heat transfer is important but is already included in the processes that give us average the lapse rate slope as defined in the US Standard Atmosphere. Radiative gases will distort that slope one way within rising air and the equal and opposite way in falling air to give a zero net effect at the surface. A quote from Freeman Dyson taken from another authors paper. On computer models..Sums it up well. Stephen, a real world example that it is air pressure that gives surface temperature is the grand canyon in the US. There is a difference in temperature between the north (2438m av)and south (2133m av) rims and between both rims and the river (640m av) when the temperatures are taken at the same time. See https://www.grandcanyon123.com/grand-canyon-weather.html where I found that little bit of information for friends thinking of a holiday in the US. Sending graph lines way up the page. The high energy Radiation from the Sun has only ONE ENERGY PATHWAY. It must always be degraded in it’s INTENSITY and capacity to heat an object or do work. Inbound solar is high energy short wave. From there it degrades and eventually leaves Earth’s holding bays, ground, ocean and Atmosphere, as low intensity IR – Long Waves. The Warmer theme that you can store up low energy radiation (Ground Origin IR ) and convert it to high energy – shorter wave radiation and beam it back to ground is Scientifically NUTSO. All of this “Climate Science” has been done on PAPER or inside the bounds of a COMPUTER and there has never been any associated physical measurement or experimentation. The only experiment I have ever seen or heard of that closely resembles the CO2 heating meme was done by the TV Programme, The Myth Busters. It was in true warmer Style, a total scientific FARCE. Four gas environments were held in simple cubes of plastic sheeting and placed in line in front of 4 heating lamps. One was normal air, the others included enhanced CO2 environments. When the lamps were turned on the Plastic environment with the higher CO2 atmospheres showed a minor temperature increase. Whether by design or error the 4 cubes were very close to each other – so close that the two end cubes were those that received less heat from the lamps. Yes , there was overlap of heat zones from the lamps which meant that the two middle cubes received heat from two adjacent lamps in addition to its own lamp. By design or error, not again, the two innermost cubes were the experimental cubes containing higher CO2 levels and surprise , surprise, they also had the highest temperatures. So Myth Busters has taught a whole generation of budding scientists that extra CO2 will HEAT the atmosphere. How do you fight this sort of crap? Ah good ole Mythbusters — good entertainment if you’re into blowing stuff up, crashing stuff, shooting stuff, building bridges out of duct tape, blowing even more stuff up . . . not so good for science. They should stick to destruction, that being their area of competence. They are southern Kalifornian too, don’t forget. Nuff said. San Francisco is north of the middle. I’m happy to say that Mythbusters is one of the first government/agency connected shows I turned off years ago. Before I turned off all the rest of the manipulative slop meant to control by flattery or ridicule of the viewer’s cool quotient. The off-button is our life, our sweetness, our hope. before commenting – JO IS ON OUTSIDERS/SKY NEWS. If so then how come I’m not laughing? The amount of money alone that has gone down the drain is astronomical. How much actual good could we have done with that money? How much actual harm have we done with that money? I’m afraid to try to answer either question. Not only have we suffered the indignity of being robbed in broad daylight but we as a nation have foregone a decade of progress and sadly no end in sight. With zero improvement around the world. Billions of dollars going into the pockets of charlatans everywhere. It’s not only Australia but the UK and many other places. The loss in money and time wasted is so large that I can’t find a way to compute it. The necessary numbers are hard to find if you can find anything and I suspect there are hidden costs we’ll never know. COP 24 is fast approaching. The 1000′s of mostly tax payer funded delegates will preach and worship that “IPCC generated Red Line” for 12 days in Katowice Poland. That Red Line is a “Line of Shame” – designed by computers using GIGO data. A line that grossly over exaggerates real Global Temperatures of the past few decades and is put simply – “scientifically fails due process!!!”. A “deceitful line” extorting US$trillions of hard earned tax payers dollars globally via un-necessary “decarbonisation policies”. The “Theory of AGW” is the greatest scam in human history. The fact the “real line” has been “almost flat” (based on the “Golden Standard” UAH Global Temperature Satellite data of the Lower Troposphere) during the past 20 years has been well hidden from the majority of Earth’s citizens by carefully planned strategies, ie corrupting many Govts and many MSM outlets. And also it seems imposing the “AGW Ideology” on some nation’s meteorological entities resulting in indefensible “manipulation of vintage temperature data” to defend the “Theory”. The net result being “corruption of science” on a grand scale. This is what the insidious “AGW Religion” has achieved during the past few decades. Hi Jo. 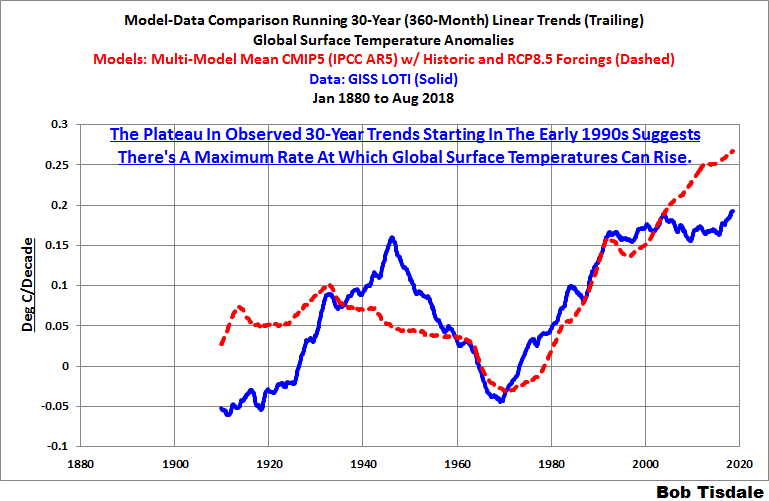 My monthly global surface temperature and TLT updates include a model-data 30-year trend comparison of global surface temperatures that I think also does a good job of showing that climate models are poo (pardon my French). Sadly, it requires people to think, and we know that many people have a difficult time trying to think. Great job Bob, just read your post on WUWT. Current average global temperature about is 15 C. Perhaps I should be worried /sarc – forecast for my home town of Melbourne is 18 C today, but on Monday the forecast is for 29 C. And in a couple of months it will hit 40 C. What a trend line. Meanwhile the doom doctors are claiming that a rise to from 15 to 15.5-16.0 C will be catastrophic. And building a few more solar and wind farms is not going to fix the problem. When is the sky going to fall? jo – you were great. good to see you are now a regular. Dr William Wills is research coordinator at the Federal University of Rio de Janeiro’s CentroClima programme, and an international consultant to international institutions such as the World Bank and UNDP. In our “Brown to Green” analysis (LINK) of the progress the G20 is making toward a low carbon economy, released this week, we forensically examine the progress of each of these economies, with 80 indicators on decarbonisation, climate policies, finance and vulnerability to the impacts of climate change. Put together by 14 organisations in more than half the G20 countries, many of them emerging economies, the analysis gives us the kind of transparency that we need to be able to properly assess this progress – and track it over time (this is the fourth iteration of this report). The Paris Agreement pledges are still lacking – only India is even close to getting onto a 1.5C-compatible emissions pathway, but it still remains wedded to coal. Seven countries are likely to miss their targets, and eight have targets so weak they’ve already achieved them. As usual, self justifying bureaucrats banging on about fossil fuels, +4C by 2100. Anyone can measure how much fossil fuel CO2 is in the air. Almost none. There is nothing to fix. Still they cling desperately to man made Global Warming of +0.5C per decade despite the fact that it has not been true for the last thirty years. The total contradiction by data should be enough, but the emergency meetings continue, from Argentina to Poland. Proving Climate Rapture has no basis in reality. ***is there any CAGW junket where an Australian doesn’t pop up! from EIT Climate-KIK website: EIT Climate-KIC is a European knowledge and innovation community, working to accelerate the transition to a zero-carbon economy. Supported by the European Institute of Innovation and Technology, we identify and support innovation that helps society mitigate and adapt to climate change. Chris has a Bachelor of Arts (Hons) from the University of NSW, specialising in development economics and a Masters in Environmental Management from Macquarie University. He has a broad background with his early career with the Reserve Bank of Australia, universities in Australia and Singapore, and an environmental publishing house and NGO. From 2005 to 2017 he worked for the NSW Office of Environment and Heritage, firstly as an economist and more recently leading climate change program delivery. He has led the development of methodologies and implementation of Integrated Regional Vulnerability Assessments in regional NSW, played a leadership role in the development regional climate projections for NSW and driving end user engagement to deliver locally relevant information. We are in deep trouble. KIC. Six Millenia of criminal justice experiments have told us that if you don’t punish crime you will get more of it. Perhaps those who flog climate change and wallow deeply in the public trough as a result are true believers. real, urgent, important, and prescriptive. At the very least you should lose your public sinecure. We are being collectively punished for being willing to tolerate these maniacs in our midst. to save the earth from “carbon” or to feed the troops? The governor of California can stand up and blame “climate change” for wildfires. Where, oh where, is the child to point out he is not wearing any clothes. The only meaningful thing we are actually doing is segregating ourselves by geography. You can’t live with these people in a live and let live environment….they won’t allow it. One has to worship their green calf, or be publicly ostracized. Strangely, this may actually come to a public head in the Supreme Court of the United States, in a giant trial echoing the Scopes affair. Does the government have the right to make massive, and fundamentally unconstitutional changes in our lives based on “climate change”. A foolish thought? The government has had to “prove” the science of water flouridation, mandatory vaccination, air quality degradation based on auto emissions, non-hazardous nature of high tension transmission lines, and a host of other things. We can fantasize that a graph such as that at the top of this article can be placed in evidence. For what? The question will have to be defined. The popular press, with comic book clarity, will continue to report on “climate change”. But we will, in fact, likely return to CAGW. Any forward looking media genius out there want to make a movie, dramatizing this trial speculatively? We’ve seen dozens of dystopian epics about the consequences of climate change. How about one covering the “end of the fraud”? A lot of brilliant comments initiated by Jo’s Brilliant post. Simple factorial analysis shows that the CO2 item is a non-starter in that it is quantitatively irrelevant in the system under examination. You cannot make a model when the one and only pivotal factor is irrelevant. In a couple of thousand years we will most likely be well into the next Glaciation with everyone heading for the Equator. Perspective is crucial in real science. Actually, KK, it works even without water vapour but with water vapour the process is more efficient and convective overturning need not be so powerful. I know that is how it really works but it needs someone in authority to run with it. Give me your forecast for the next two decades, then we’ll have something to run with. Mostly it will be cool where the heat don’t reach, as temperature readings increase numerically. Periodically they’ll be seasonal rain when the droughts stop. Overall the weather will substantially influence the climate, to such a degree that on average the climate may track the general trajectory that the weather pattern variations determine. In conclusion, the hotter areas will stay warmer than the cooler areas, and the very wet areas will stay more moist than the deserts, and the climate will change. Sounds almost like Chopper Reid’s weather forecasting for Alice Springs! Tom the green blob say areas which are dry will become deserts and wet places will become wetter, this is not good enough. What we are looking at is a return to the 1950s and 60s, so where ever you are in the world just look back to see the future. Private long range forecasters rely on old rainfall and temps as part of working out future weather ,this is made just that bit harder by the BOM and their homogenisation regime . Which is why the sleuths have to search for the unadjusted data, Jennifer Marohasy is on a quest and in a letter to Greg Hunt she expresses her concerns. That was in 2014, now if you look at the synoptic chart on the nightly news there is this constant flow of south-easterly winds up the Queensland coast. Its a regional cooling signal. but the greenies only look at averages, I attempt to assess the overall mean of medians that occur on average while simultaneously allowing for the stochastic determinism of a constrained chaos of the weather/climate system. Okay, that can be the permanent forecast, which will enable staffing reductions in the commercial weather industry. the T 4 average and compares it to the fictitious Earth’s average temperature of +15 ◦C. moistness, and on the local ground conditions as water, ice, rock, sand, forests, meadows, etc. I would guess that this is what early humans did during the previous glaciations. As there werent no food in them plains when covered in a mile of ice. The Neanderthals were forced down by the ice and had to find living space in already occupied areas. I think they got to near Gibraltar but their adaptation to another lifestyle probably was a handicap. They had very large brains compared with ours and were physically robust. Given as time goes on more and more people will know that the models are a joke and in fact deliberate lies, it’s time Morrison to get out of Paris. He should have announced it as soon as he became PM. Better late than never. Come on Morrison you have to understand you either stand for the truth or stay ignorant and become a fool when you lose the next election. Same argument with immigration. If he only does the right thing on just those two issues his prospect of winning the next election would be enhanced enormously. Morrison may be avoiding bringing about an end to the CAGW scam because so many ordinary Australians are caught up financially through their retirement funding. Big Banks, Big Unions and others have “invested” excessive amounts of Super Funds under their “Management” in “Ethical Save the Planet” areas. Damaging this creation may have serious consequences at the next election after the fall. A government created nightmare all done by those we should be able to trust. There is no Engineering or Cost Basis for the use of Renewables in power production. A crime has been committed by subterfuge and Justice should find and punish the perpetrators and beneficiaries. 1. Announce exit from Paris as Trump did (sends a simple message he is a sceptic on CAGW). 2. Cut immigration by at least 50%, preferably 80% for at least a few years (sends a simple message the major cities are full and infrastructure needs to play catch-up). 3. Announce that all subsidies for renewables and RET schemes will be abolished if he wins the election (sends a simple message he is serious about significantly reducing power prices). That should guarantee a major electoral victory assuming enough voters are awake. If not enough are awake it won’t matter in any case and we can look forward to a crash and burn scenario under Shorten. Morrison has so much to gain and nothing to lose given he has already lost the next election with his current form and strategy. It would be more productive to let Paris ride for the time being, same goes for the RET, they can do it in a canter. To capture the popular imagination the government only has to say we are seeking tenders for three new coal fired power stations and a bullet train network to alleviate pressure in the cities. The LNP is in no mood to spend additional 10′s of billions of dollars. In any case they are socialist policies. We need to get back to the business of promoting the private world to fund such projects, not to make the national debt much worse than it already is. Beijing will build them for a song. Cory says we should save Liddell and then build nuclear power plants to replace the old coal plants. You can see how he is pandering with this expensive non option. Cory should just say CO2 doesn’t cause global warming, so there is nothing to stop us building new coal plants. He lacks political nous and can never be a Donald Trump. Bernardi is no Trump but possibly ,arguably he is the closet we have to Trump , as for calling out Co2 he does that all the time , remember when he roasted Malcom Roberts for voting with the ban on small engines . Cory needs to join the Kelly and Abbott bandwagon, focus on energy deprivation and demand a new coal fired power plant for South Australia. He doesn’t have the bottle. Join them , he could see what the Libs had become so ditched them . Robert he ditched the Libs because Malcolm Labor Lite became PM, there is nothing to stop him returning to the fold and get a front bench seat. I dare him to say South Australia needs a coal fired power station because global cooling has begun, it would open the Overton Window and he would become heroic. Just checked their policies and you’re right about not directly mentioning full support for coal ,just politic speak for supporting coal . Had a look at ‘Common Sense’ and he is all over the place, peddling soft options. Cory should know the coming election is about immigration and energy, so he should drop everything else and focus. Isn’t that the mechanism that Subsidises renewables, feeds the elites bank accounts and makes our power bills at least 3 times higher than they should be. 'Free Australians To Become Rich Again' or the 'MATBRA' plan. ‘Free Australians To Become Rich Again’ or the ‘FATBRA’ plan. Notably union superannuation funds which would be the real basis for Labor adopting the RET and transition to renewable energy. Just as Labor created the Superannuation Guarantee Levy after deregulating the banking and finance industry in 1985 and did not provide an industry specific watchdog, APRA was established by the Howard LNP in 1998. Of course the non-union affiliated super funds and banks joined in the consumer rip offs as recently exposed by the Royal Commission. pity Johns graphs stops at the peak of the El Nino. oops , forgot to add that the red is UAH data. Not sure if I’ve got this right, less heat escapes earth during La Nina? Nice to see you on Outsiders last night Jo! Just got to get you onto Q&A, now that would be fun! Probably a waste of time to get on Q & A, as there would be a hanging jury ‘live audience’ all picked and packed ready to attend. Not forgetting Flannery, Steffen, Karoly and Brian Cox on the panel. I’m always a little amused by the graphs of model predictions showing an exponential temp increase as co2 concentration increases. That hardly makes sense, if equilibrium climate sensitivity is based on X temp increase per doubling of co2 concentration. Yes, the models are a joke. check the photo used for his Wikipedia page – more regressive than progressive? In 2016, he co-authored with Michael E. Mann The Madhouse Effect, describing the global warming controversy. BRUSSELS – Britain will be excluded from the European Union’s Emissions Trading System (ETS) and all other legislation to help limit the impact of climate change, if it leaves the bloc in March 2019 without a deal, the EU executive said on Tuesday. Last month, the UK government said it would(sic) that in a no-deal scenario, the country would next year switch to meeting its carbon pricing commitments via a tax system. European carbon allowances are forecast to remain above €20 even in the case of a massive sell-off by the investors who helped prices triple in the past year, analysts said. The European Commission has cautioned stakeholders over their suggestion that the EU carbon market is being manipulated, as participants called for more transparency. As Politics.co.uk’s Ian Dunt (who is having a very good war) observed recently things are about to go “all wibbly-wobbly” as the long-standing divisions between Leavers and Remainers fragment along new lines. Both tribes are now splitting into ‘the gamblers’, who would reject the government’s deal in the hope the fallout results in their desired outcome (be it a People’s Vote and crushing Remain victory or a deregulatory, WTO rules, ‘no deal’ spree ***in the disaster capitalism casino), and the risk averse ‘play-it-safers’, who understandably fear the economic cataclysm of ‘no deal’ and will hold their noses and support an imperfect Withdrawal Agreement to avoid it. For the green economy this new dividing line is complicated by the fact a path towards a Green Brexit remains just about visible. “Unfortunately, we made mistakes here,” said Ralph Keeling, a climate scientist at Scripps, who was a co-author of the study. “I think the main lesson is that you work as fast as you can to fix mistakes when you find them. (He has published a more detailed explanation of what happened here LINK). This isn’t the first time climate scientists have been dead wrong about the perceived odious nature of so-called global warming. For starters, in 2007, they predicted the Arctic ice cap would be gone by 2013, but it has grown by 533,000 square miles. Yes, we’ve had a wild hurricane season, but in 2013, it was the calmest one in three decades. Global warming is supposedly creating more wild weather, which so happens to coincide with seasons in which…wild weather occurs, like hurricane season. In that same year, it was the quietest tornado season in 60 years. Maybe, and this is just a thought, that the science isn’t settled, because there really is no such thing as settled science. It changes. And we shouldn’t be pushing nations to cannibalize their economic growth, kill jobs, and reduce everyone’s standard of living based on liberal histrionics that were just gutted by a math error. So if the atmosphere is not warming, how is CO2 heating the oceans? Or is it improper to ask such questions? Do you need to form an end of the pier group? Piers is always deliberate and never shies away from calling the climate hoax a hoax. As in taking a long walk off a short pier. Or just jump. Then there is the Pier Hotel. My sort of Pier group. Heat Islands. I would like to challenge anyone with a visible outside temperature display in their car to watch it closely when you take a drive in the country and drive through an average 1 to 20,000 population town particularly in summer. I do it regularly and have seen at times up to 6 degrees change from one side of town to centre and out the other side drops back again. Most small towns around 2-3 degrees. how can temperatures taken inside these towns be acurate. I have not noticed that I will definitely be on the lookout from now on! For a start they are not taken using cars. No but its useful anecdotal evidence and would be a perfect lead for a 300 word essay on BoM adjustments. Would cars be any less accurate than 80c for the place in Brazil or 0c for the Caribbean island ? No, its taken near tin sheds and air-conditioners. Those urban reading that possibly apply for some 10-20 km² are then spread over the whole region, hundreds, sometimes THOUSANDS of km², where they most definitely DO NOT apply. Its one big smearing of FARCICAL, highly biased urban data, over every part of the globe. It makes a total nonsense of anything pretending to be a global average surface temperature. If you had even the most basic grounding in REALITY, you would know that GA.
It’s how air-cooling works with all vehicles and how their engines keep their cool. Some use direct air cooling like the old VW Beetles and many motorcycles and some small aircraft with their heavily finned engines. It’s how automotive radiators for those engines which don’t use direct air cooling with engine fins, such as most modern vehicles including cars, motorcycles, trucks and buses. They keep their engines cool through their `radiators’ which don’t actually `radiate’ in quite the usual accepted manner. The vehicles don’t overheat as long as they keep moving. It doesn’t matter if it’s wind or the engine or the radiator which is moving through the air. The air removes the heat as it moves over/through the hot object or as the hot object moves through it. The guy running the organic garden at the top of Galeries Lafayette in Paris argues that urban growing gives you a much longer growing season. I’m of the opinion that global warming is a trivial matter and not worth arguing about. It’s a slow two-horse race. 1700 was cooler than 2000. Does that mean 2300 will be hotter than 2000? May as well argue over whether heads or tails is a better call. But UHI is just common sense. It’s not as simple as measured mean max, however. There’s a lot more to heat than mean max, which is why the long, detailed and accurate Sydney Obs record is, sadly, the least interesting. If only life was stats! Media director for the newly formed Saltbush Club. Hopefully one of the Saltbush Club’s first targets will be Woodside CEO Peter Coleman? what sort of a club targets people not in the club? Do you hope the club has some purpose of its own? Good questions, I would like to see more information on this club. One other point, sort of in-house, this habit of yours to start off a sentence with lower case is unacceptable. Thanks Peter, good news indeed. Yesterday after your prompt, I went looking for a connection between Jo and the Saltbush club; nothing. The link this morning does it. After the two pieces from Jerry Ellis and Hugh Morgan I had to come back and thank you. This has made my day, if not my next year as well. The guiding statements should attract all decent Australians and the fact that so far in what I’ve read it seems to be apolitical, should give added authority. Looking forward to developments in moving Australia back on track. Sorry Peter Coleman , Not Mr Morgan. What about the club of Rome ? I used to hunt lions with a club. It wasn’t all that dangerous. There were 500 of us in the club. Millions of pounds of public money is being misspent because of “abuse” of green energy schemes, a whistleblower from the energy regulator Ofgem claims. Edd Fyfe, a former counter-fraud officer, alleges big businesses exploited weaknesses in the management of schemes to make huge profits. Mr Fyfe worked as a manager in compliance and counter-fraud between 2013 and 2017 for Ofgem E-Serve, a branch of the energy regulator which approves and polices green energy subsidies across the UK. He was particularly concerned about the Domestic Renewable Heat Incentive, which is intended to encourage householders to use greener alternatives to fossil fuels. Mr Fyfe says that there was “industrialised” subsidy-claiming among some firms. In return for “free” biomass boilers, they induced householders to sign away their generous incentive payments. Mr Fyfe alleges that there were poor levels of oversight and control. He says when he reviewed cases where subsidies had been awarded, he would find 50% or sometimes 60% did not comply with the Ofgem guidelines, and some involved serious abuse. He says his bosses did not always respond well when he told them what he had found. Mr Fyfe felt there were pressures within Ofgem senior management because there was seen to be “a risk of the management of those schemes being taken away from Ofgem and contracted out to a private company”. He argues that controversial business models arose between 2014 and 2017 where some companies would require homeowners to sign leases on their property as part of an agreement to supply the boiler. The subsidy money then went to the company. Mr Fyfe said that at the time, the Ofgem legal team said those so-called “third-party models” were not allowed. However, he said: “There was a huge drive to get as many applications through as possible. There simply were not checks getting done. They were processed willy-nilly”. Mr Fyfe claimed auditors would tend to “push back” against visiting sites in certain parts of the country, including Orkney, Shetland, the Western Isles and Northern Ireland. He also said Ofgem’s policy was to announce their visits two or three weeks ahead of time, and that the regulator would take “quite a sympathetic approach” to excuses such as illness or bereavements, so audits could be delayed to the next quarter, “or kicked into the long grass”. Mr Fyfe took his concerns about the Domestic RHI scheme to senior managers at Ofgem in 2016, but they “pushed back”. He argues this was because so many sites had already been accredited and that to admit flaws in the system would have put the scheme into disrepute. He contacted the National Audit Office, and Ofgem then agreed to hold an independent investigation into his concerns. At the end of that process, he was disappointed. He says there was no change, he thinks because Ofgem was under fire for what had happened in the Northern Irish version of RHI, known as the “cash for ash” scandal (LINK BBC: RHI scandal: RHI ‘cash for ash’ scandal to cost NI taxpayers £490m). He says that what was happening in England, Scotland and Wales “was worse than what was happening in Northern Ireland”. Mr Fyfe said that he was threatened by Ofgem with the use of sweeping powers under Section 105 of the Utilities Act. He says he was told he could be fined large sums or even sent to jail if he spoke out. In September 2017, he decided to leave his job with Ofgem E-serve. He sought help from the charity Protect, which aids whistleblowers. This month, he opted to talk openly about his concerns to File on 4, without the protection of anonymity. According to his allegations, Ofgem had lost control of the system and was recklessly paying out many millions in the form of green energy subsidies which come from taxpayers’ funds. Earlier this year, the Public Accounts Committee investigated the Domestic RHI scheme and found rates of fraud and non-compliance were “too high” and Ofgem had not even estimated the cost of manipulation of the system. You can hear the full report on File on 4 on Tuesday at 20:00 GMT and afterwards on BBC Sounds. I work for scientists (public sector). My experience, those that are vocal are climate change adherents. They rely on the usual CAGW obsessed media sources. They do not admit to reading skeptical media. It is an impenetrable bubble with massive govt inertia. I do not have the courage to voice my opinion as I feel I woulb be exiled for my sins. I cannot imagine them publically questioning the CAWG hypothesis. They are in a feedback loop with our inept pollies and journos. I am pessimistic that this trinity will ever admit error. Bit of a downer but that is my conclusion from my small interaction with Australia’s Climate Club. It may nor get better after they retire, plenty of PhD acolytes in the pipe line. Just relooked at this, I dont have the link just now its under “The Eco fr@ud” published in 2010. It outlines WHERE the fr@ud comes from and WHO dun it! Its all quite clear, this is why the models dont work, they were never intended to work on real data. 1980 Villach, Austria Conference. UNEP invited national governments to send scientists to its climate conference. claiming human production of carbon dioxide caused global warming despite no evidence for that claim. political issue when NGO’s and other groups led concerted campaign that falsely appeared to be grass roots. by the UN IPCC itself. references were not peer reviewed. Many written by activists. none of the media I heard since yesterday gave any sense of the uproar over the deal that was negotiated by the PM. TWEET: Nigel Farage: Nothing has been achieved by @Theresa_May other than to give away a huge sum of our money. It’s the worst deal in history. Theresa May is now speaking in Parliament. In its latest climate outlook, the BOM said it was expecting December to be wetter than average. The El Nino phase of the El Nino Southern Oscillation is usually associated with dry conditions in Australia. So how can there be both above average rain and an El Nino? Dr Andrew Watkins, manager of long-range forecast at the Bureau of Meteorology, said there was more than one climate driver at play. A spring scorcher on Friday of 36 degrees Celsius is shaping up as a taste of things to come, with a hot summer heading our way — in stark contrast to the unusually cool summer of 2017-18. Perth did not record a single day over 38C last summer but above average temperatures are expected over much of Western Australia this time around, according to the outlook for December to February from the Bureau of Meteorology (BOM). “It was unusual not to have a 40-degree day in summer,” BOM spokesman Neil Bennett said. “… It would be a reasonable assumption to think that we would see high 30s and possible 40s again because that really is a trademark of Perth summers, particularly as we move into January and February. Last season, Perth experienced its longest run of summer days below 35C in more than two decades, with the cool spell lasting 31 days. “The average [maximum temperature] for Perth for summer is 30.7C. We’re obviously thinking it could be warmer than that, but there’s nothing to suggest at the moment that it will be a record-breaking summer,” Mr Bennett said. Pat given Bom’s record in long term forecasts is abysmal you could almost count on another cooler than average summer for Perth. ‘Last season, Perth experienced its longest run of summer days below 35C in more than two decades, with the cool spell lasting 31 days. Hedging their bets, they don’t have a clue. I forecast it will be a cool summer, like last year, because the subtropical ridge has lost its intensity. You won’t hear this from BoM, otherwise it would be an admission that carbon dioxide doesn’t cause global warming. SO 2 degrees is going to be a problem? Monbiot follows up his 18 Oct “As the fracking protesters show, a people’s rebellion is the only way to fight climate breakdown”, in which he wrote: “On 31 October, I will speak at the launch of Extinction Rebellion in Parliament Square”, with another call for a revolution! Last Wednesday I attended a meeting about environmental breakdown at the Institute for Public Policy Research. Many people in the room seemed to understand that continued economic growth is incompatible with sustaining the Earth’s systems. when will Australians understand where Paris is leading? The farm union NFU said it supported more diverse land use. NFU deputy president Guy Smith said: “We are glad to see many of our policy asks reflected. It is very encouraging to see such a focus on multi-purpose land use, diversification and energy crops as they offer opportunities for farmers to increase productivity and resilience in their businesses, while playing a greater role in meeting climate and environmental objectives. Protesters have been arrested after defacing government buildings and super-gluing themselves to the gates of Downing Street. At least 27 environmental campaigners, including Labour councillors and NHS staff, were arrested, police said. Campaign group Extinction Rebellion said more civil disobedience was planned. A number of activists were arrested earlier this week at the headquarters of the Business Department. The activists tried to block the entrance to Downing Street, holding up food containers reading ‘food shortages coming’, with some lying on the ground and one gluing himself to a railing. The protesters then moved on to a Department for Environment, Food and Rural Affairs office. Rep.-elect Alexandria Ocasio-Cortez (D-NY), a progressive darling who overtook longtime Rep. Joe Crowley (D-N.Y.) in a primary this year, is backing the idea of a “Green New Deal” and wants the special committee to work toward the goal of 100 percent renewable energy, an idea its backers say would spur job growth. Rep. Ro Khanna (D-Calif) also supported the “Green New Deal” charge for a special committee. Incoming Rep. Alexandria Ocasio-Cortez’s visit — and high-fives — with climate protestors at House Democratic Leader Nancy Pelosi’s office shows both energy and fault lines on the left over how ascendant House Democrats should approach the topic. But, but, but: The prior iteration of the committee had no power to write legislation, and Pelosi’s office yesterday did not respond to an inquiry on that question. pic of Stephanie suggests a somewhat zealous nature! A Little Shop toy has been found thousands of kilometres away on an Indonesian beach, sparking backlash from environmentalists. An Aussie mum has slammed the “terrible” Coles Little Shop campaign after finding one of the toys on a Bali beach. “We were having a little break and went down to the beach to get a drink. In the conference, we had only just been talking about marine conservation and plastic pollution,” Ms Shaw told Caters News. “As we were walking along, we noticed the amount of rubbish and plastic on the shore. Then all of a sudden, I spotted this familiar Coles ‘Little Shop’ plastic Nutella toy laying in the sand. Hughes is an internationally renowned coral reef scientist based at the Centre of Excellence for Coral Reef Studies in Townsville, one of the world’s leading research institutes in the field. Last month, in a Senate estimates hearing, the Australian Research Council revealed the centre had failed to secure new funding and had been unsuccessful in even making its funding shortlist. Hughes has declined to comment on the funding decision but on Thursday said he was grateful to receive an award “that goes beyond the normal nerdy science medals”. He said Australians had become motivated by science that showed the effects of climate change on the Great Barrier Reef. Guardian provides no info on the judges; nor does it explain the Prize is promoted by SenseAboutScience.org. But arguably thousands of people can make claim to have won the prize because in 2007 it was awarded to the Intergovernmental Panel on Climate Change (IPCC), a grouping of thousands of scientists and other experts who regularly evaluate the latest science to report on the state of the climate and the prospects for our planet. 15 Nov: Guardian: If celebrity victims of climate change can’t silence the deniers, who can? This year, the global heatwave was so pronounced that even habitual climate sceptics – the Sun newspaper, for example – felt moved to point out that the world appeared to be on fire. “Environmental and Climate storytelling ” sort of sums it up , when I read an article like this I realise the warmists have the upper hand and truth is the first casualty in any war . There seems to be a discrepancy between the forcings driving the Climate Model curve and the Observed Temperature curve, as shown in The Climate Study Group’s presentation of the JR Christy data. The discrepancy relates to the direct heat output of fossil fuel consumption and nuclear power. I calculated a 3.7W/m^2 forcing as 21,050GW worldwide. I wondered how that compared to the total heat output of the world’s nuclear power stations. I summed the NPS output[1:] to 352GW and multiplied that by three for the 33% thermal efficiency and so arrived at a total heat output of 1,055GW. The NPS output is about 5% of the AGW forcing. The NPS output is also shown as about 5% of the world’s total power consumption, mostly supplied by fossil fuels. 1: The anthropogenic direct heat output is about the same magnitude as the claimed AGW forcing by CO2. 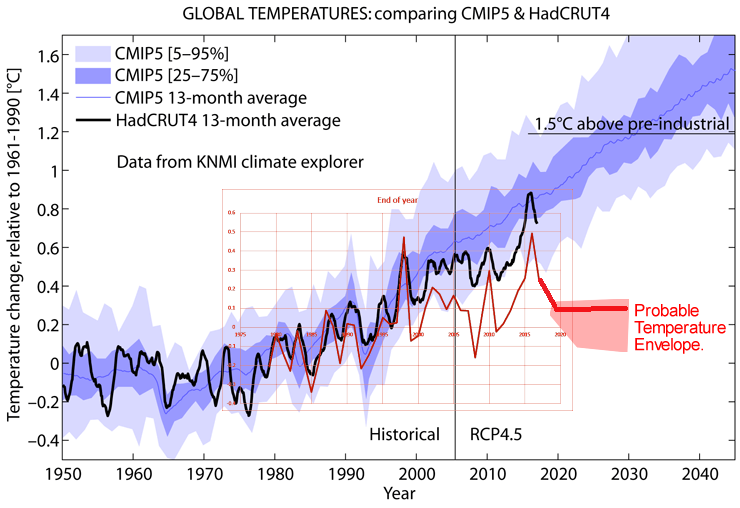 2: The Climate Model curve is based on about half the Observed Temperatures curve’s total forcing, yet the Climate Model curve rises at about twice the rate already. 3: If both graphs were based on the same forcings, then the y-axis would have to be doubled to accommodate the Climate Model curve. 4: If my logic is right, then the models are obviously and seriously out. Slightly off post topic, but wondered if you had caught sight of this little jewel from the Breitbart pages? Of course their models are full of errors. The question of course no one can be sure of is if any of the errors are deliberate. Some would say of course but no one can say for sure, not unless and until we get a whistle blower. It doesn’t really matter anyway because the “in your face” aspect is far more powerful. We know as a fact from observation the models are way out of line. Yet so many people still rely on them as though they are proof of CAGW, including many politicians here on both sides of politics. It really is time to smash both major parties at the next election to flush them out once and for all. That is if voters really care enough. I doubt they do. Much more pain to come. Has this negative feedback to the CO2 cycle been incorporated into any “climate” models or theory as opposed to the as yet undemonstrated positive feedback/water vapour effect? It’s time to ask all those who believe the planet is doomed because of catastrophic human-caused global warming to lead by example for at least one year to prove they can make a difference. No more trips to the Maldives, Bali, or the Great Barrier Reef. In fact no flying anywhere for one year. Buy a bike, no more use of petrol/diesel cars or buses. No more imports that rely on fuel oil burning container ships. No more gas or electric heating. No more air-conditioning – that will stop a lot of carbon burning – just open the windows when it’s hot and use a human-propelled fan. And finally, conserve your own energy by speaking less – the less effort you exert the less of that dangerous CO2 you will exhale. There, feel better? Those nasty cows belching all that methane..it must stop! What about the farting going on around the House of Commons at the moment? Speaking of models and predictions, I do enjoy our own beloved BOMs seasonal predictions. This article in the Age by a couple of the usual alarmist suspects is a classic. It leads with an “expect a hot dry summer, everywhere but here!” here being the south east corner. Then you look at the BOM colour coded graphic. Any reasonable person would see that the bulk of the continent has a 50/50 chance of better than average rain, the south west corner has a better than average chance of rain, and it is only the top of WA (I know its a massive surprise isnt it?) that its likely to be hot and dry. The attempt to whip up hysteria from a fairly benign forecast is a bit pathetic. Overlayed with the issue of these forecasts accuracy it all becomes a bit of a joke. I recall Jo featuring a prediction vs actual a while ago and they looked like mirror images. Sort of appropriate for the climate world where black is white and reality is meaningless unless it can be contorted to fit the narrative. They don’t mention the collapse of the subtropical ridge or blocking highs, a global cooling signal. They really are a disgrace and I demand a Royal Commission to look into their ignorance. A weak El Nino this summer means Australia’s east coast, up to Cape York, should be cooler and wetter. Whatbhas got me confused is that the bureau has claimed we have a positive SAM atm. Synoptic chart indicates a vigorous front affecting the SE early next week.This positive movement of systems toward the pole will increase rainfall.Does this mean it will allow the intrusion of moist tropical air from the north to facilitate above average rain for December.OTOH I would have thought that the interaction of cooler Polar maritime linking with this air from the north could be propitious. Agreed that the sub tropical ridge is well to the south. A million observations may SUPPORT a theory, but it only takes ONE observation to DISPROVE it! With the AGW anti-science, there are NO OBSERVATIONS to support the hypothesis/farce. There is ZERO empirical evidence that atmospheric CO2 causes warming. Richie Allen on fire about the EU (run by 27 un-elected bureaucrats) and how it is nothing more than a prelude to a One World Govt, played comment from Von Rumpoy (Unelected EU president in 2009) who stated on record climate change is a ‘threat to our existence’ and a one world government is what is needed to combat it.. The original TPP talk was all about trade. One who read the whole deal found that there were 29 chapters in the agreement, only 5 of which had to do with trade. The rest were in the spirit of the above comment. One of the reasons Trump ditched it. Thus I fear for what is in Mark 2, which we’ve just signed. In the Herald Sun this morning, Green insanity on show. Adam Bandt. Despite coal accounting for more than three quarter of the national energy market, the Greens will introduce a Bill in Federal parliament in the coming weeks to make it illegal by 2030. The burning or exporting of the black rock will become a criminal offence as part of the proposed new laws. Companies would face fines of over $10Million. Senior executives could be sent to jail for up to seven years. The Greens’ plan would see Australia quit coal home and abroad by 2030. Also 60% of Australia’s coal is black metallurgical coal, not thermal coal. Labor has form in banning thermal coal. The Brumby Victorian Labor government previously banned a $400Million sale of brown coal to India. According to the Melbourne Age at the time, the exporters were going to squeeze out the water (it’s 66% water) and that would make it blacker, which was not acceptable. Also Labor’s Daniel Andrews tripled the price of our brown coal to Hazelwood, forcing the early closure. The facetious excuse was that an increase was long overdue. Now of course Hazelwood pay nothing. Communist lawyer Bandt just keeps making it up. (His PhD is on communism). They do not even bother with any sense of reality. “Funds raised from coal export permits .. would be used to support Australia’s coal communities”. So caring. So in 2030, our international income is reduced by more than $16Billion. I suppose if they banned coking coal, we would lose another $24Billion, so we have to be grateful for small mercies from the caring Greens. How banning just our thermal coal exports is going to change world CO2 is not known. We are the world’s biggest ‘exporter’ as most countries have their own coal and we have much more than we can use. Also Indonesia has equalled us in exports and as they produce only thermal coal and will just up production to cover the shortfall. It’s all about virtue signalling while we go broke. Then, that is Bandt’s communist dream. Revolution in Australia following collapse of the economy and a general strike. Our own Lenin. The madness continues and could be argued it’s actually increasing, and the nation is heading over the cliff for sure. Our only hope now is for the voters to recognise this (hahaha) and make sure neither major party wins government at both houses. They do not deserve to be in office until they stop pushing the CAGW crap, which is directly leading this nation to economic destruction as sure as if we decided to smash all our dams and rely on tank water. It’s not much different to the UK where the majority voted to leave the EU but the politicians are conspiring to keep Britain a vassal state of the French and Germans. After two world wars to stop precisely that, Churchill would be appalled. Oh !, the Brexit vote.! That was very conclusive wasnt it ? 17.4 million voted to Exit ..
Thats 38% of the electorate , or just 27% of the full population voted for Brexit. Not what i would call an overwhelming majority for such a critical decision . So it is not surprising there is continuing debate. ! And EVEN LESS voted to stay. It’s also amazing that a party with a single representative in the 149 member democratically elected House of Representatives presumes to write Australian laws? 9 senators trying to run the country when the Senate is a house of review for States rights, not legislation. I read recently that B A Santamaria opined shortly before his death that this country would be taken off us. Were Adam Bandt to succeed in legislating to keep coal in the ground then we would actually deserve to have the country taken off us. A little reminder for the utterly science ignorant Greens. All metal smelting requires coke/carbon/coal. Iron, Lead, Zinc, Aluminum,… The pure carbon removes the oxygen from the metal and CO2 into the atmosphere. Harmless and essential for life, like H2O. So go ahead Greens. Ban metals in Australia as you did Chlorine as in salt. Go fly to your conference in wooden planes with wooden propellers and rubber bands for propulsion. Can you imaging the green world, without metals? Without Carbon, you have no metals. As Greenpeace founder Dr. Patrick Moore said, he only met one other Green with any science qualifications. Lawyers and business people and opportunists and after the fall of the Soviet Union, frustrated Communists. It used to amuse me driving into Broken Hill to see the “nuclear free zone” signs. As potassium is an essential element I still wonder how they handled that? Clive Best has made a very simply model of ice ages, based upon the dust-ice-albedo feedback theory. And considering this is a ‘back of an envelope’ model, it does much better than any other ice age model. This video I present is some pretty sciency stuff. At least it was for this truck driver. However I was able to get the gist of it by giving it my undivided attention. There is a basic concept that one must learn or have learned to understand it. That is the fact that accuracy and precision are not the same thing. For those not familiar with this concept the best way this former soldier can explain it is by this example. When one is zeroing in the sights of a rifle they typically fire 3 shot groups. A grouping of three shots that over lap indicates a high level of precision by the shooter. But no matter how precise the shot grouping is, it is not accurate unless it is in the bullseye. Anyway I found it well worth my time (43 minutes) to watch and learn the fundamental problem that plagues climate modeling.